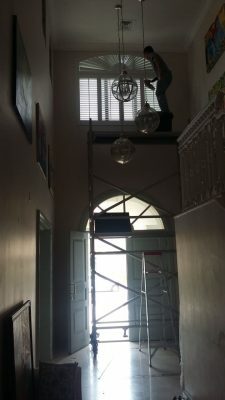 Often at Emirates Shutters we’ve encountered this common concern of our customers that they want to get plantation shutters installed, but their windows are too high up and many of them also had this misconception that windows in such positions cannot be covered. Emirates Shutters’ installation crew is powered up by experienced and highly proficient craftsmen who time and again have verified the brand’s quality work with their service. While we’re at it, we would also like to highlight the success of our latest project in Palm Jumeirah. Our valued customer Ms. Natalie’s house is a gorgeous piece of art with uniquely shaped and positioned windows which were difficult to reach with traditional methods, therefore our team had to opt for a more unconventional and risky approach to get the job done. Look how Mr. Rino our expert is standing up the ladder and pulling off that precarious stunt of shutter installation. Wondering how your shutters will be installed? We believe in going an extra mile for each customer to provide the ideal window look which is why our installation methodology is customized according to window’s size,location and treatment. Regardless of challenging settings our team would fix and fasten the shutters to the window frames thereby assuring its longstanding. 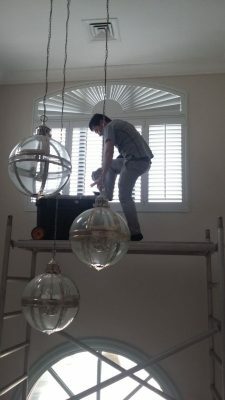 Our brand’s promise is to deliver a seamless and smooth experience which is why our team will ensure cleanliness of the shutters and surroundings once the window styling is completed, making it seem like we were never there other than your stunning shutters! We would love to answer any further queries you may have regarding shutter installation.